Your unique measurements are applied to the Sure-Fit Designs™ Master Patterns. The resulting pattern accurately reflects your body shape and circumferences. Yes…personalized fit is definitely achievable putting confidence back into your sewing! Blouses, tops, skirts, any style of two-piece or one-piece dresses, and jackets or coats can be designed with this flexible fitting, sewing & designing kit. Here is a sampling of what can be sewn - get your free illustration download here. Not included with just the Dress Kit? Reg Dress Kit Combo = Dress Kit, Stylus & How-To DVD. 1x10yd Tracing Vellum & designing book 'Beyond Bodice Basics'. Maxi Dress Kit Combo = Dress Kit, Stylus & How-To DVD. 1x10yd Tracing Vellum, designing book 'Beyond Bodice Basics' & the Bodice Fitting Course DVD - an in-depth tutorial on working with the Dress Kit bodice. When it says 'Dress Kit Only', it means exactly that. 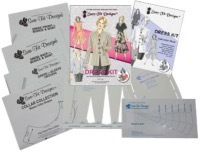 You'd receive just the Dress Kit at regular retail price - no discounts.